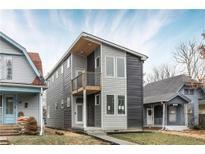 Find Fountain Square, IN New Homes for sale. View Photos, Maps and MLS Data Now! Location, finishes, and quality construction afford Sexi Lexi to have a name that matches its style. Buy Lexi, and become Sexi! MLS#21632101. CENTURY 21 Scheetz. Gourmet Exquisite Kitchen with Pantry, stainless steel appliances, range hood, built-in oven & microwave, cooktop, center island, granite countertops, chic lighting & lots of cabinet space. Must see! MLS#21628027. Keller Williams Indy Metro W.
Home features gorgeous hardwood floors, raised ceilings, a wet bar, breakfast room, bonus room, Jack & Jill bedrooms, upstairs laundry room, 2 car garage, a good-sized yard & is conveniently located near popular Fountain Square dining, shopping & entertainment. MLS#21616454. Keller Williams Indy Metro S.
Martindale And Cos - Includes a 22x20 2 car garage WITH studio/office space on second floor and fully fenced in back yard! MLS#21618922. Hanza Realty, LLC. Perhaps you would like to lounge on the back deck with fully fenced in back yard or maybe have a night out at the bars and restaurants within mere footsteps in HOT Fountain Square! MLS#21618920. Hanza Realty, LLC. Check out attachments for the finish spec sheet! MLS#21609498. Plat Collective. The house is in 3 minute proximity to top nightlife spots, famous restaurants, city top employers and sports arenas MLS#21599587. F.C. Tucker Company.